It was just after 6pm when I headed east out of the maddening streets of downtown LA into the belly of East Los Angeles. With the remaining sunlight smeared across the western sky, and the traffic jam in my rear view mirror, my stomach rumbled in anticipation of the upcoming taco feast. I barrelled through the LA basin back to the taco town that has yet to let me down- El Sereno. 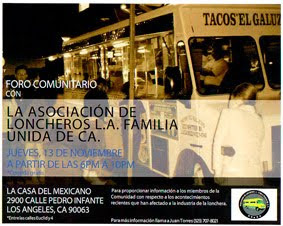 El Sereno, the land of a thousand tacos, where only the finest taqueros set up their taco enterprise. The taco dictators would never dream of building a Baja Fresh or Chipotle in El Sereno.It would crumble under it’s own hubris. Not accepted it would be laughed out of the city, forever scorned. I knew I was going to have good tacos when I pulled up to El Ranchito.A lousy taco truck can’t last in this town. But I wasn’t sure what to order. That’s until a nice gordita in front of me ordered 4 carnitas tacos to go.One rule when taco hunting- trust the locals. “Well,you like the carnitas eh” I say. ”don’t forget the hot sauce! give him the hot sauce!” my gordita friend squeals. My tacos came with onions ,cilantro and a firey red salsa roja. The roja was king taco-ish except not as thick. The roja was spicy but It didn’t overwhelm me. But maybe after all my taco eating my tongue has become immune to the hot stuff. But the carnitas was outstanding - the soft delicate pork was not your standard shredded carnitas. It was so juicy, had so much flavor. The best carnitas I’ve had so far? perhaps. The al pastor,strikelingly similiar to the shredded saucy pork found at La Estrella was just as pleasing. But the carnitas wins the heart. In ode to the taquero I made a gesture to my lips pronouncing my love for his tacos and ordered two more de carnitas. 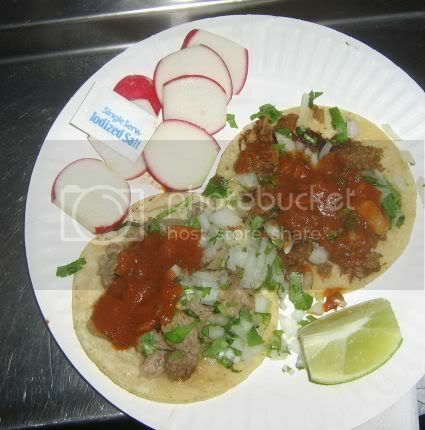 This time I asked for a jalapeno,a subtle way of telling the taquero that his salsa did not intimidate this gabacho. He smiled in acknowledgement and placed a juicy plump jalapeno on top of my carnitas tacos. 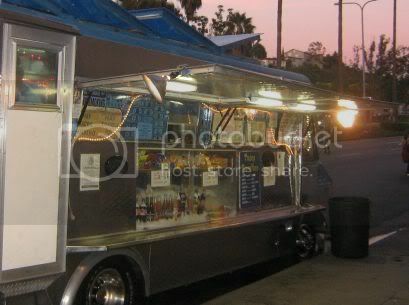 Where on Huntington can I find this wondrous truck? El Sereno's a big neighborhood. silly me forgot to write down the address of the market it parks in front of. I believe the side street is Portola ave. Gives me an excuse to head back there though. I've been following your quest for quite awhile, and I think you're heading for the deep barranca. In the meantime the taco truck phenomenon has not really hit SF yet -- they're here, but they're never all that great. Keep going, carnal! We live in awe! The best taco review blog, ever! Mmmm carnitas are my favorite! I too wish to cry when eating my tacos. Sometimes you need a good taco cry. Taco truks abound in San Jose, almost all have Great tacos! I tried El Ranchito is August 2007 with a few of my friends. I ordered the carnitas but it was not as good as it was described by Bandini. There was not much flavor to it. I also tried the carne asada and there wasn't much to that one either. Maybe I came on a bad day. Will try it one more time if I ever get out there though. I'm a local 'pocho' and many a late night I knock down four 'tacos de buche con todo' and 'un burrito de carne asade con todo', with a bottle of horchata and a bag of chicharones. These rolling gods serve up the best tacos around, especially after a night of Guinness and bar popcorn. There is also a great big wall for you to lean against which will steady you as you try negotiate squeezing that lemon over the most beautiful thing that you've probably seen all night. It's is on the east bound side of Huntington Drive, just east of Van Horne (right in front of the legendary bar The Lark, which is now just an empty lot). Give them a visit. Be gutsy and try the red chili, it has a nice smokey flavor and compliments the meat nicely (and most nights it's not that hot). In fact, me thinks I'll grab a few tacos tonight. AND NOTHING GETS THIS MAN MORE INTO HIS JOB THAT SCREEMING "ARRIBA LAS CHIVAS"
I love El Ranchito. I grew up in El Sereno until jr. high then my family moved to the Pasadena area. You can take the girl out of El Sereno but you cant the Sereno out of the girl. Whe nmy family needs a food truck fix, we make the drive to hit this spot up. 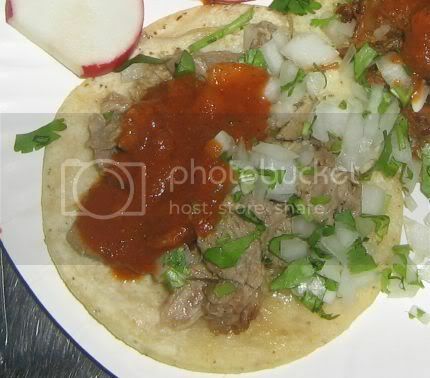 Everyone has a favorite my brother: Al Pastor, my mom: carnitas, my dad: caren asada and I always get the lengua. All of them are amazing. Like what other have said, the salsa roja is nice and smoky... I like it better than the salsa verde.